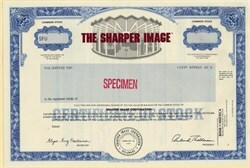 Beautifully engraved Rare Specimen certificate from the Sharper Image Corporation printed in. This historic document was printed by Security Columbian Bank Note Company and has an ornate border around it with a vignette of the company logo. This item has the signatures of the Company's President and Secretary and is over 19 years old. 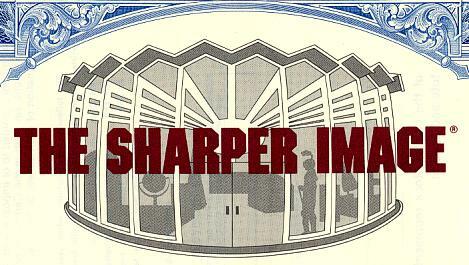 The Sharper Image is a specialty retailer that is nationally and internationally renowned as a leading source of new, innovative, high-quality products that make life easier and more enjoyable. A significant and growing proportion of sales are of proprietary products created by the Company's product development group, Sharper Image Design. The Company operates about 100 stores throughout the United States and mails millions of its award-winning catalogs each month. The Company's products may also be purchased on the Internet via its online store at sharperimage.com. The Company also has an online auction site where consumers can place bids to win Sharper Image products at lower prices; the auction site is access ed from the home page of the Company's Web site. The Company also markets its products through business-to-business sales for corporate marketing programs and wholesale customers.